We awoke to snow falling, what a way to start the new year! I measured 4″ (10 cm).The violets are always such a pleasant surprise to me. The snow looked especially pretty on this Contorted Filbert bush (aka: Harry Lauder’s Walking Stick or Corkscrew Hazel) and the bricks. which protects plants growing on the embankment behind. Under the behind fences are thriving California poppies and struggling daylilies. The snow was quite wet and many plants were drooping from the weight of the snow. I got a broom and walked around the house, knocking snow off branches. she is much happier after snow removal. There are two rhododendron bushes in this photo. I keep pruning the one on the left, as it grows prolifically. The specimen on the right has its growth eternally challenged. but that dog has been gone over 10 years, and the plant has not really bounced back. I made sure to brush snow from its branches to give it every chance I can. Categories: Uncategorized | Tags: contorted filbert, corckscrew hazel, Harry Lauder's Walking stick, new years day, Rosemary, snow, violets | Permalink. Last winter I gave away a number of babies from this Rosemary plant. Some lower limbs had rooted in the ground as new plants. It has also been pruned severely, and may look a little sparse. No worries, there is now plenty of space for it to fill out with new growth this summer. Tiny, pale blue flowers complement the pleasant aroma of the needles when the plant is stroked. 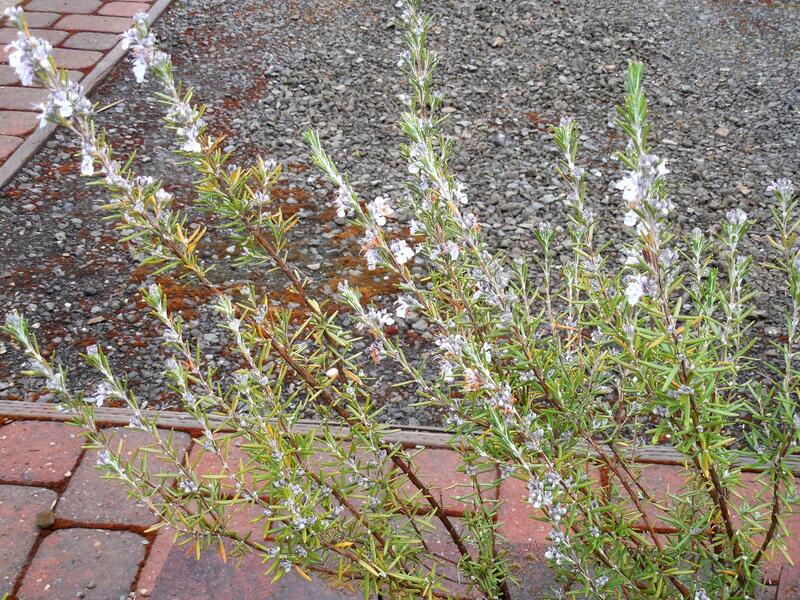 Rosemary is very tough and drought resistant, give it the sunlight it craves and it will be a reliable garden beauty. I do dry rosemary needles to use in the kitchen through the year. A stem laid across a piece of salmon when baking, will impart a subtle scent of this herb. Categories: Uncategorized | Tags: aroma, baking salmon, drought resistant, herb, Rosemary | Permalink. It took a few tries to get a photo of these small flowers when the wind wasn’t moving them around. Most herbs wait until later in the season to flower, rosemary is the earliest that I know of. Deer stay away from this plant, as they do most all aromatics. I love that feature in a plant while I am living here. I’ve seen rosemary plants growing in all sorts of climates. My biggest surprise was when I saw a row of upright rosemary plants growing on a commercial side street in Las Vegas. These are very drought-resistant, and grow in various sizes from sprawling to a good-size shrub. A woman told me how she trained her rosemary plant in a round, not circle, shape using metal wire as a guide. I haven’t figured that out – yet. Give me a little more time. Categories: Uncategorized | Tags: aromatic, blue, deer, drought, flower, herb, resistant, Rosemary, shrub | Permalink.